Invoked for a bountiful harvest, Feronia the Goddess of Fertile Blossoms is also the Goddess of Agricultural Produce. Moreover, She is the Goddess of the Flower of Youth and its Pleasures. One tradition associated with Feronia is that She is the Goddess of Freedom by Slaves. If a slave sat on her holy stone in her temple, they were set free. When I make vegetable soup, I always thank Feronia for the variety of vegetables to choose from. We thank You for the bountiful vegetables and fruits. 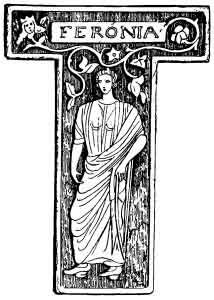 This entry was tagged feronia, God of the Month, plants, Roman. Bookmark the permalink.